The Tesla Model S has just won some very high praise from the highly respected Consumer Reports. As they note in the video below, Consumer Reports has been testing cars for a very long time, and after testing the Tesla Model S they said, “this car performs better than anything we’ve ever tested… Not just the best electric car, but the best car”. Wow, take that naysayers of electric car performance! The Model S earned a very impressive score of 99 out of 100 in the testing process. That’s the highest score ever given by Consumer Reports. As far as electric cars go, the Tesla’s 200+ mile range, and 0 to 60 miles per hour in 5.6-seconds torque really impressed. The testers noted that the low center of gravity due to the big battery back on the bottom helps give the car excellent handling performance, and the design of the car is second-to-none. One small gripe the testers had was with the car’s giant iPad-like touch screen in the middle of the dash, which can apparently distract the driver’s eyes away from the road a little too much. Another small issue is that on long journeys, the car has to stop to recharge for reasonably long periods; but even then, Tesla is covering that with its growing Supercharger Network along major routes. Part of the appeal of that is that charging is completely free, and the stations are fed with solar power. For the moment, it almost seems that Tesla can do no wrong. 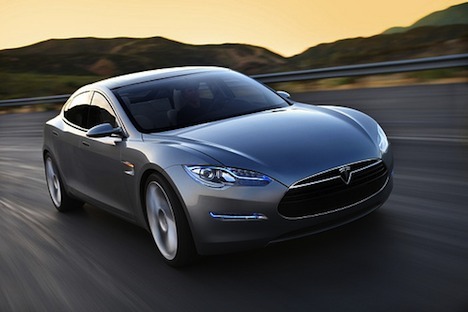 The Tesla Model S is turning out to be quite the iconic vehicle is the history of automaking. The full report can be found here, but watch the video below for a quick take.